I’m in love with this colour! 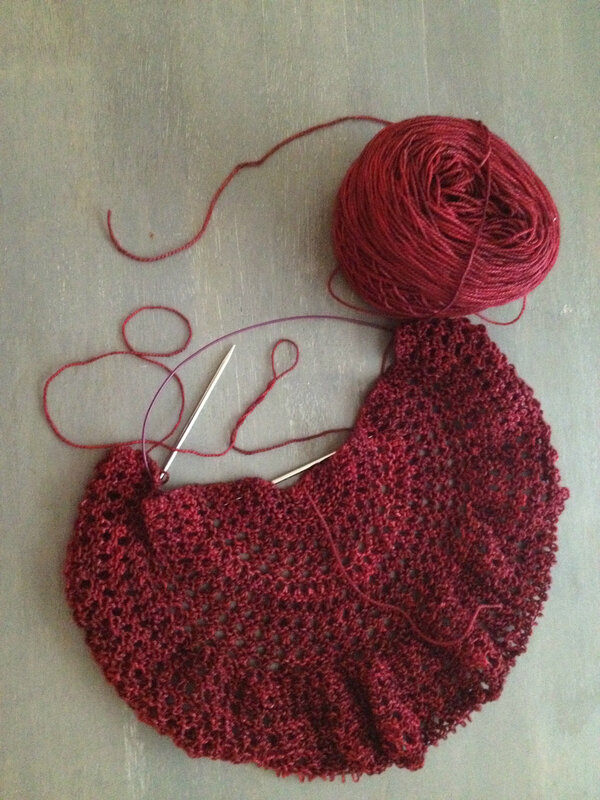 I finally had a decent amount of time yesterday to really work on my shawl. Before and after going out walking with my friend, I sat down and just knit. It was wonderful. That, and we had no Internet. Usually I panic when there’s no Internet. What am I going to do? How will I keep myself entertained or keep up with my writing on My Writing Spot? Oh no! This time, I was slightly irritated, and then quickly got over it. This meant I had to actually use the Blu-Ray Player if I wanted any sound from the TV. We haven’t used the player in ages! I had no distractions. I put in The Help, one of my recent favourite movies, and curled up in the corner of the sofa. As mentioned earlier, my friend and I did manage to go for a walk. I was surprised that I didn’t feel deprived from my knitting. It was a nice pause, and after I returned, I was able to enjoy being more awake and aware of what I was doing. I felt more focused. Usually I stop around 9pm because my eyes are exhausted (that might also have something to do with sitting at a computer at work 8-9 hours a day). Yesterday, though, I made it until 10pm, when I forced myself to go to bed so I wouldn’t be too tired in the morning. Quick comment on the actual project: I love this shawl! I love how the colour changes throughout the yarn, giving the piece a fuller look to it. I can’t wait to wash it, block it, and wear it, even in our 90-100 degree heat! Okay, I might night wear it outside, but second winter starts right about now, too. Soon, the indoors will be so cold! Perfect excuse for a beautiful shawl. True to me, even though I’m only about to start the 3rd repeat of rows 59-63, I’m daydreaming about the next project. I’m hooked on shawls. They’re beautiful and so much fun to make. I should probably finish the yellow one first, before I get too into another project. I can’t help it, though. My eyes keep wandering to new projects. Love it! It makes me want to start one as well, but I have to finish the one on the needles first. Thanks for sharing.